Shares in the main iron ore miners — Vale (NYSE:VALE), Rio Tinto (ASX, LON, NYSE:LON) and BHP Billiton (ASX, NYSE:BHP) — reached an almost one-year high after the steel making commodity recovered from hitting a three-year low of $87.50 in early October. 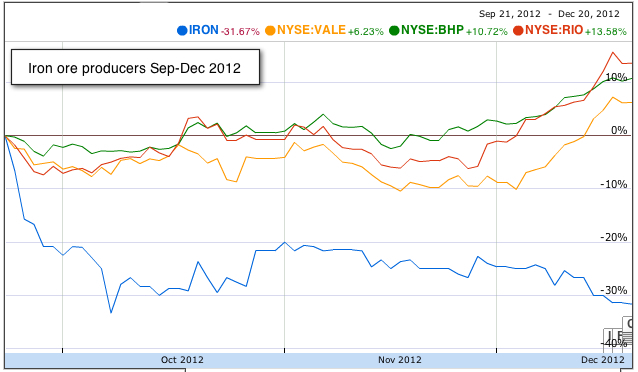 Stocks for the iron ore giants climbed to levels not seen since February this year. Iron ore has traded this year as high as $150 a tonne and as low as $87.50 a tonne, making it one of the worst performers in the international commodities market. Iron ore is seen as a proxy for industrial activity and construction in China. The commodity is critical for the profitability of large mining groups, including Vale of Brazil, Rio Tinto, BHP Billiton and Anglo American, as well as Japanese trading companies such as Mitsui & Co. The price of iron ore is also crucial for the world’s largest steelmakers, including ArcelorMittal and Baosteel Group of China. Shares in BHP, the world’s largest miner by market capitalization, climbed in London Wednesday to a session high of £21.79, the highest since early February. Rio Tinto, in turn, gained 0.6%. Benchmark 62% iron ore at China's Tianjin port added 2.2% on Monday to $132.20 a tonne, the highest price since July 13 according to data from Steelindex. The price was boosted by news from China's National Bureau of Statistics that inventories of iron ore at the country's top 30 ports fell to 73.7 million tonnes – the lowest level in over two years and the 7th weekly decline in a row. Iron ore has now recovered more than 50% from its September lows, but is still off the average price for 2011, which was around $150 a tonne. The steelmaking raw ingredient reached a peak of $191.90 in February 2011.